Dental inlays and onlays help to restore moderately damaged or decayed teeth at the back of the mouth to provide strength and stability for normal chewing. If a tooth requires restoration work and is too decayed for a normal filling but not damaged enough to require a whole new crown, then our dentists at Freedom Dental will recommend a dental inlay or onlay depending on how the tooth needs restoring. A dental inlay is used in the centre of the tooth whilst onlays are placed on the outer parts of the tooth. Dental inlays and onlays are commonly known as partial crowns but the treatment is less costly than a full crown. The treatment is safe and provide the necessary protection to help keep the tooth strong for many years. The treatment first requires preparation and an impression to be made so a local anaesthetic is given before the procedure begins. 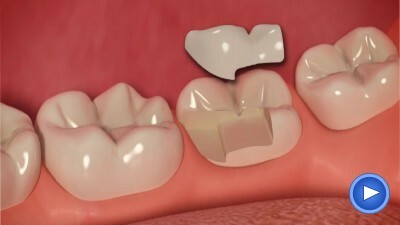 Once the inlay and onlay is created, it will be cemented into placed and then our dentist will clean and polish the tooth for a perfect finish. At Freedom Dental our porcelain of choice for inlays and onlays is the highly aesthetic and durable Emax ceramic. This material will beautiful restore the form and function of the tooth in the same way as the natural enamel. Matching the colour of your teeth? 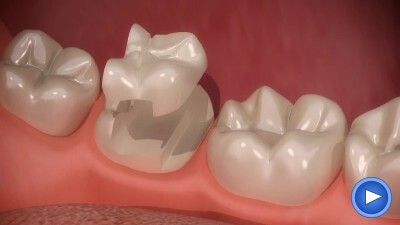 Dental inlays and inlays can be made of a number of materials. Metal such as gold was commonly used in the past because of its natural strength and durability but they are aesthetically unpleasing to the eye when a person laughs or smiles. Dentists now use materials such as composite resins and porcelain which can match the colour of the tooth and are strong enough to last for many years. Do I need an inlay, onlay or dental crown? Freedom Dental will be more than happy to arrange an appointment for you so that our dentists can assess the damage of your tooth. They will advise the best treatment for you and will always look to protect or save as much of your tooth as possible. If you would like more information or wish to book an appointment then please call 0161 486 6821. Alternatively you can send us an email or simply fill in the online enquiry form here.